Bottle gourd vegetable is yellowish green in color vegetable and usually in shape of bottle. Botanically, bottle gourd belongs to the broader Cucurbitaceae family of plants and scientific name of bottle gourd is Lagenaria siceraria. Different types of gourds available in market with different names such as calabash, white-flowered gourd, opo squash, long melon, suzza melon, New Guinea bean, lauki and Tasmania bean. It is African originated vegetable, now it is cultivated in India, Sri Lanka, Malaysia, Philippines, China and South America. Bottle gourd is available in year around and it is very cheap and affordable. It is one of the easily digestible vegetables as it contains 90% of water and it also rich in vitamin C, A and K and essential minerals like sodium, calcium, iron, zinc and magnesium. Bottle gourd is very popular for weight loss in Ayurveda. 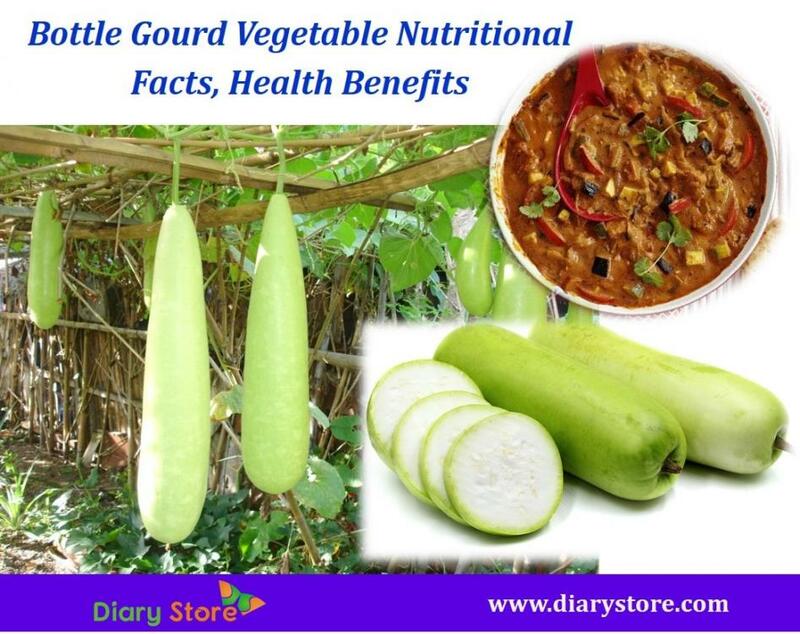 For its lot of health benefits and nutritional facts bottle gourd is one of the well-known cooked vegetables in the world. Bottle Gourd Vegetable contains high amount of vitamins, Minerals, carbohydrates, proteins, antioxidants. Here below listed the nutrition value per 100 grams (3.5 Oz), percentage of RDA (Recommended Dietary Allowance). Bottle gourd contains the sodium, potassium and other essential minerals, which are regulate the blood pressure. Bottle gourd is packed with both, soluble and insoluble dietary fiber and high amount of water helps in curing constipation and reduce the risk of digestive system problem like acidity and flatulence. To reduce your weight, drink this vegetable juice regularly in the morning on an empty stomach. Due to less amount of calories and high amount of dietary fiber, vitamins, minerals in Bottle gourd keep the body well-nourished and curb unnecessary appetite. Due to high amount of water in bottle gourd keep the body cool and refreshing. And it is also prevent the fatigue. Having bottle gourd or bottle gourd juice in summer is extremely beneficial. Bottle gourd contains high amount of sodium and potassium, it is an amazing vegetable for people with hypertension. Drink bottle gourd juice regularly in the morning on an empty stomach helps in lowering your blood cholesterol levels and maintains healthy heart functions. Bottle gourd contains high amount of vitamin C, which is reduces the wrinkles and dryness of skin. Drink fresh Bottle gourd juice can help in treat urinary problems. Mix bottle gourd with lemon juice to treat the urinary tract infections and others problems. Bottle gourd vegetable has good amount of choline, which helps in preventing stress, depression and other mental disorders and also improve the brain functioning. 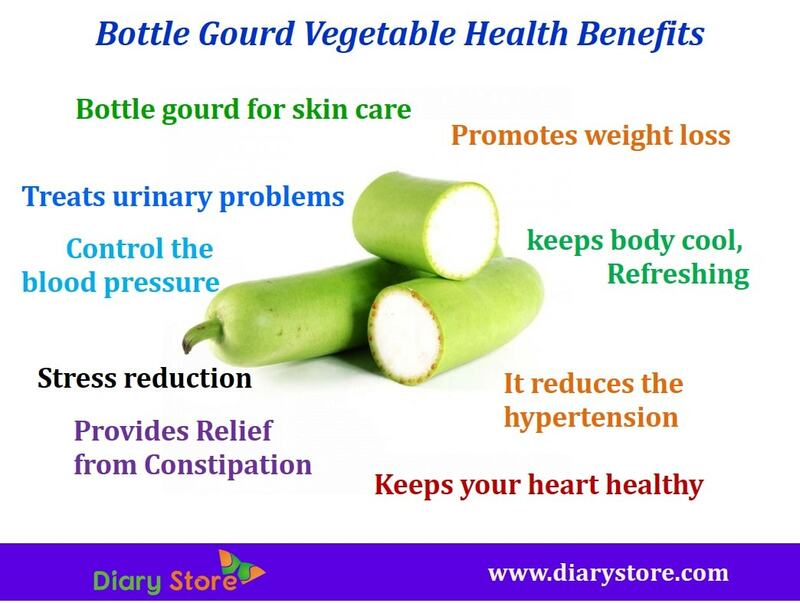 However bottle gourd has lot of health benefits but also has some effects. Major effects are drinking bottle gourd juice, which is tastes in bitter, may damage your digestive system and may causes incidents like deaths or any other serious illness. After consumption of this vegetable, if you find some symptoms like stomachache, diarrhea, vomiting; please do consult your doctor as soon as possible.